There is a wide variety of forklift attachments that are available today and they are used for various purposes. Usually, these attachments are used when the conventional forklifts are not enough to move and transport certain types of stock or materials. With the addition of attachments, the forklift becomes a very versatile piece of equipment. Like most forklift accessories, some attachments are simple, for instance, extensions for lifting a variety of products, whereas some attachments that might require their own set of controls that need to be incorporated in the console area of the forklift together with a power source. Blade extensions are the cheapest and most common type of forklift attachment and are normally used in order to move pallets that are beyond the usual length. 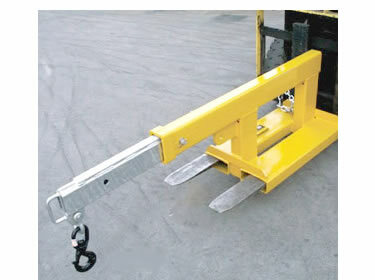 These extensions are placed on top of the forklift blades and slide on and off without any difficulty. 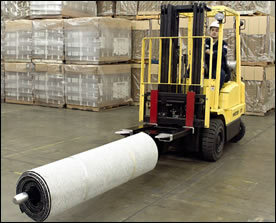 A carpet pole is another type of forklift attachment that is used to transport carpet rolls. 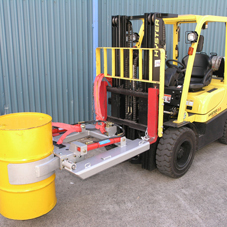 These attachments may either be mounted directly onto the lift-truck blades or they may be fitted directly onto the mast of the forklift, which requires the regular blades to be removed. Certain attachments are designed specifically to carry and handle drums. These attachments contain a particular component that envelopes itself around the drum and provides support in order to lift and move the drum around. Some are designed in such a way that the drums can be tilted with the purpose of pouring out liquids, these however need a separate set of controls and a source of power. Sometimes, loading freight or cargo directly onto a piece of equipment or to a certain area may not be feasible. For instance, certain situations may require the forklift to haul up the freight over a wall or barrier. There are forklift attachments that are designed to resolve this problem and they are known as booms. This particular attachment hooks onto a piece of cargo and moves it over what could be a wall or barrier. There are some forklift attachments like hoppers, sweepers and brooms that are attached directly to the forklift and can prove to be useful in keeping the warehouse or workplace clean. One more popular attachment is the scale. This attachment gives the operator the ability to weigh a product merely by picking it up. A scale is of great use in the transportation industry where shipments can be weighed and verified. This attachment also requires a power source. Other forklift attachments include side-shifters that enable the operator to move the forks laterally and facilitate load placement. Rotators, that allow the operator to rotate the forks and can be used for quick unloading and the man basket alternatively known as the safety basket, is used to hoist workers.